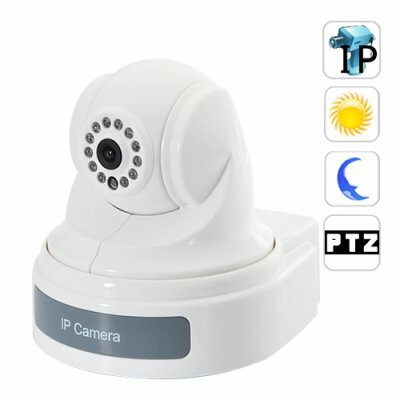 Successfully Added IP Camera with PTZ - Internet Surveillance Camera with Sony CCD to your Shopping Cart. New deluxe edition IP Surveillance Camera from Chinavasion. This powerful and feature-rich security IP Camera with PTZ comes standard with night vision, web browser controlled interface, DVR functions with motion detection and even 360 degree full rotation pan and tilt. It is the perfect product for your home, office or retail store. With high performance DSP chip-set, the latest embedded Linux system, fully integrated web server function and the ability of streaming both audio and video simultaneously, the I64 IP Surveillance Camera is the ultimate home or business security solution. There are alarm input and output connectors, so you can hook it up with existing alarms in your house or office to have alarm triggered video recording or sound the alarm if movement is detected by motion detection. The I64 (IP Camera with PTZ - Internet Surveillance Camera with Sony CCD) lets you view, record, pan and tilt from another room, another building, or another country because it works with your computer's networking system to support LAN, Intranet, and even Internet monitoring. Imagine being able to monitor your home in Paris from your office in Sao Paulo! No need to imagine - this IP Camera with PTZ does it all! You can even control the camera with 360 degree horizontal and 90 degree vertical viewing angle to point it to any direction you want, so nothing can escape your sight even when you are sitting 10,000 miles away from it. What's more, this high performance security IP camera is using 1/3 Inch Sony CCD sensor and 6mm lens for the best possible images, clearer and brighter. Even when you turn off the light, the built-in sensor will automatically turn on the 12 IR LED night vision. This amazing product comes with our famous 12-month satisfaction warranty and are available with a factory-direct China Wholesale Price that you cannot find anywhere else. Don't delay, whether you only order a couple for your high class designer home or a few to sell them on your storefront, click on "Add To Cart" right now and we will express ship them out tomorrow. We recommend using Internet Explorer (version 6.0 or newer) to access the web control interface. You will also need to install the Active X files from the CD to be able to view the camera. Up to 10 people can view this IP camera simultaneously! Can I use this product for my home or business security/surveillance? Absolutely, this product is perfect for your normal home or business security/surveillance needs as well as webcam based business. Once your customer gains control to the camera, he can rotate the camera head at will to point it to any direction he wants. How about make the camera move up/down if he is pleased, or left/right if he wants more! It will surely be more fun than your old hunk of plastic. Is it possible to have multiple remote end user streaming video from a single camera at the same time? Yes. Depends on the bandwidth of your network, you can have multiple user watching the same "video surveillance" simultaneously! Is this IP Security Camera like ones I have seen from Samsung/Panasonic/Vitek/IQ/Messoa? Yes, it is the same as those, except the I64 comes with a factory-direct low wholesale price, meaning it only costs 1/3 the price! Why can't I view the web interface with my Firefox?